Tintype (2.25 x 3.5 inches) inserted into a decorative paper frame/envelope (3 x 4.75 inches; I scanned only the tintype here). Photographer is Mann Bros. of Electric Park, New York. Otherwise undated and unidentified. Here’s another history lesson for me. Apparently in the early 1900s there were dozens of amusement parks across the country called Electric Park. They were typically owned by the local electric company or the local streetcar company. As far as I can tell, they called themselves the same thing without sharing corporate ownership. (For instance, Disney theme parks around the world are all owned by Disney, but Electric Parks just called themselves the same thing without any formal connection.) But I could be wrong. In any case, there were several in New York state alone, so I can’t be sure which one this photo was from. (A quick internet search on the photographer didn’t tell me anything.) Meanwhile, there’s this tintype. 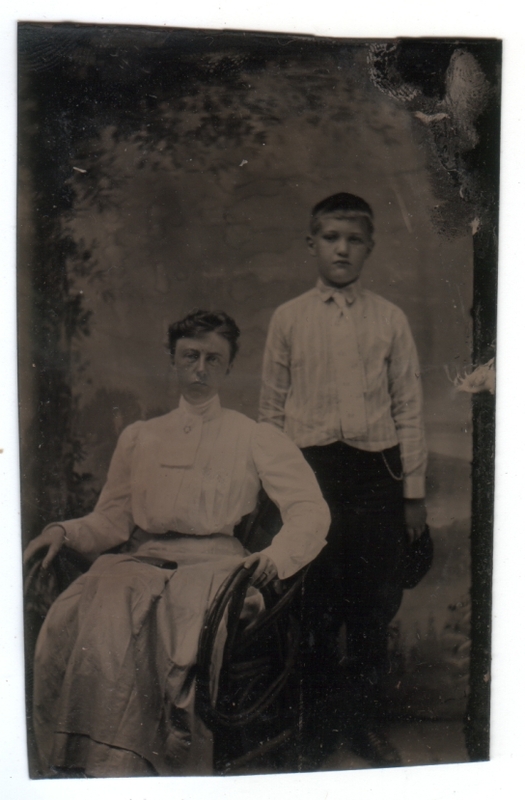 I chose to scan it without the paper frame because the frame was rather battered and because it obscured too much of the photo (the boy’s feet, the woman’s right hand, etc.). I know smiles were rarer in old photographs, but man, they look like the amusement park’s charms are lost on them. I’m also struck by the clothes. I know, I know, people dressed like that then, and I appreciate that they are in their shirtsleeves and wearing lighter, summery fabrics, but I guess after months of staring at these photos for this blog it still sometimes amazes me what people had to wear in those days (the kid is wearing a tie!). Imagine expecting people to dress like that today for an afternoon at Coney Island or Great America! I read that Walt Disney credited Electric Park in Kansas City as one of his inspirations for Disneyland–I had no idea there was more than one park called that. I had no idea, either. Apparently there were quite a few. I agree totally about the clothes being a tad formal for the occasion. I suppose it was as much about proving your position in society as anything else. Summers in Oz are horrendously hot in most places, yet throughout the Victorian era and right up till the 1920s there was no concession to the weather as far as clothing went. It must have been horrible to keep up appearances like that! Re Electric Parks, I found the same thing when researching Pennyland amusement parks. I could not find a connection between the 1/2 dozen or so that I could source info about. I wonder if the Electric Parks became Pennyland? I remember my parents getting dressed up to go make their mortgage payments each month. And Mom putting on her best clothes to go shopping. Her lipstick and perfume fascinated me (of course). It’s hard to remember that mindset today. Good point, it wasn’t all that long ago. Of course, I’m not sure that sense of pride has necessarily left our culture, but rather expresses itself in different ways. Maybe. I know people rarely smiled in photos, and they put on their most serious faces, but may I just say…I would not want to be disciplined by that woman. And it doesn’t seem that he does, either. I know what you mean. The kid looks like someone who isn’t happy at the moment. The woman looks like someone who isn’t happy ever.